PALM BEACH GARDENS, Fla. (CN) – Golf legend Tiger Woods’ Wednesday morning arraignment on a DUI charge was rescheduled amid reports that he would enter into a first-time offender program, which would allow him to avoid a DUI conviction by pleading guilty to a lesser charge of reckless driving. Woods’ arraignment was rescheduled for Oct. 25 at the Palm Beach Gardens courthouse, roughly 7 miles from where police arrested the golfer on a DUI charge after finding him sleeping in his Mercedes on the side of the road in May. Woods did not show up in court Wednesday morning, as his attorney Douglas Duncan appeared on his behalf. Prosecutor Adrienne Ellis said Woods is expected to enter into the DUI diversion program, according to the Associated Press. The popular Palm Beach County program allows first-time DUI offenders to plead guilty to reckless driving, serve probation, attend a victim panel and complete community service hours, among other requirements to avoid facing a DUI conviction. When reached by phone, the state attorney’s office for the Fifteenth Judicial Circuit said that a plea deal was not in place as of noon Wednesday. In the incident that spawned the case, an officer from the Jupiter Police Department discovered Woods sleeping in his vehicle, parked on the side of the road in the early morning hours of May 29. The vehicle was damaged and had flat tires. Police said in their arrest report that Woods was disoriented, and that his speech was slow and slurred. The 14-time PGA major champion struggled to complete sobriety tests, including the “one-leg stand” and “walk and turn” tasks, according to the report. Officers booked Woods on a charge of driving while intoxicated. The Jupiter Police noted that a breathalyzer test did not detect alcohol in his body. Woods released a statement blaming the incident on prescription medicines that he had taken. The police report indicates that Woods had been on painkillers and anti-inflammatory medication. The golfer said on his website in April that he had been experiencing severe back and leg pain and recently underwent an operation to treat a damaged disc. 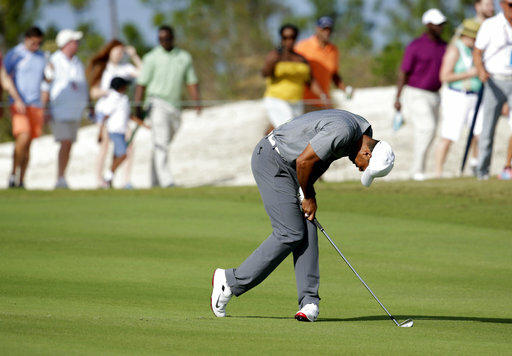 In a widely publicized 2009 accident, Woods crashed into a fire hydrant near his home in Windermere, Fla. The accident came as media coverage of Woods’ extramarital affairs was mounting. Woods lost sponsorships with Gatorade and General Motors in the wake of the scandal.